Have I mentioned that I CANNOT WAIT for this to air? I’ve been BSG-less for far, far too long. Oh, and if anyone out there is taking note, I would absolutely love to have any and all of the BSG dvd’s for Christmas… Santa? You listening? I just finished watching all of the little flashback episodes on the SciFi website, and they so got me right into the BSG mood. Old-school Cylons, a creepy secret lab with a project involving human experimentation (gee what could it be? ), young Adama’s first combat flight – all awesome. Nico Cortez is completely believable as young Bill Adama, I’m not sure if it’s the actor’s ability to mimic Olmos’s facial expressions or if they really do look that much alike, but honestly I think that Nico would have been a perfect choice to play one of the Adama sons if things had worked out differently in the beginning of the series (sorry Jamie B.!). The few episodes I managed to stomach of Bionic Woman have made me really miss Battlestar, Katee Sackhoff is a remarkable actress and I enjoyed every second of her time on screen. If they had found a way for her to star in every storyline then the show would have held my interest, no question. 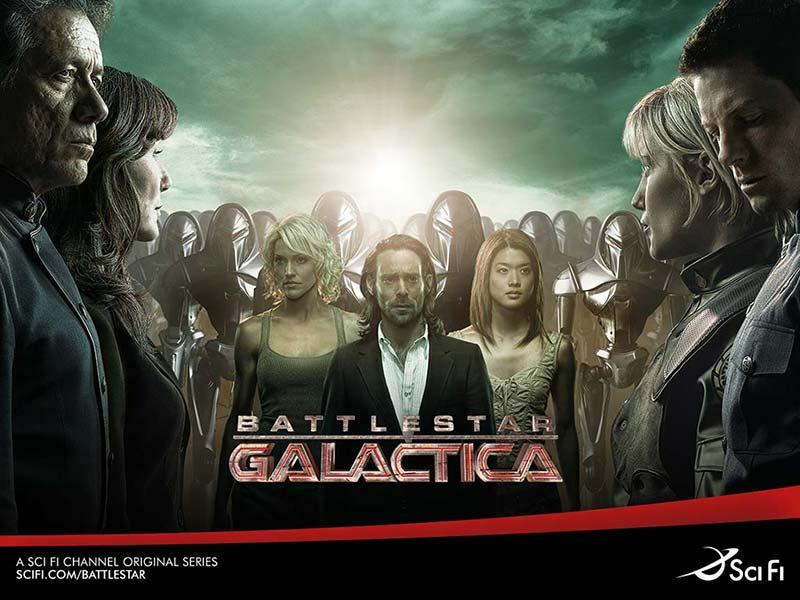 Hopefully the WGA strike will be resolved equitably and quickly, I read that production on BSG season 4 was supposed to continue through March and that it will instead be coming to a halt soon if it hasn’t already. This is not good news people, Scifi has already jacked with the last season by timing it weird and possibly splitting it up, and I just couldn’t handle it not happening at all. There might be a nervous breakdown of some sort, and my poor dog doesn’t want to witness that. This weekend will see me happily ensconced at a friend’s house watching Razor, be assured that I will present my full report here. So say we all! I, too, will be a a friend’s house when it airs here in the UK (I’m a bit eccentric in that I only have our basic terrestrial TV setup – only 4 channels!) on the 5th December. The snippets I’ve seen so far are just wonderful; I really can’t see how they can possibly screw this up! I think our antennae will pick up 5 channels plus the Spanish channel which I watch only to entertain myself by providing my own translation. I thank the internets daily for giving me more entertainment options. I’m not sure what I did before broadband, I have a hazy memory of reading a whole lot more and dealing with a lot more commercials. I read ron moore’s blog he suddenly decided to start during all the strike drama and he seems determined to find a way to tell the rest of the story, but how could it possibly be the same if they have to shut down production and the actors and writers and everybody go their separate ways? Supposedly 13 episodes of 20?22? are in the can, but that is SO not good enough!